SCHTZKARTE for dealers: with up to 43% margin (depending on order volume) against the end-customer price. SCHUTZKARTE protects your credit cards, bank cards, debit cards, bonus program cards and ID cards from digital pickpocketing. Your personal information is safe with the wallet in your purse and wallet when the SCHUTZKARTE covers your cards completely. Put the SCHUTZKARTE simply to the banknotes in your wallet. 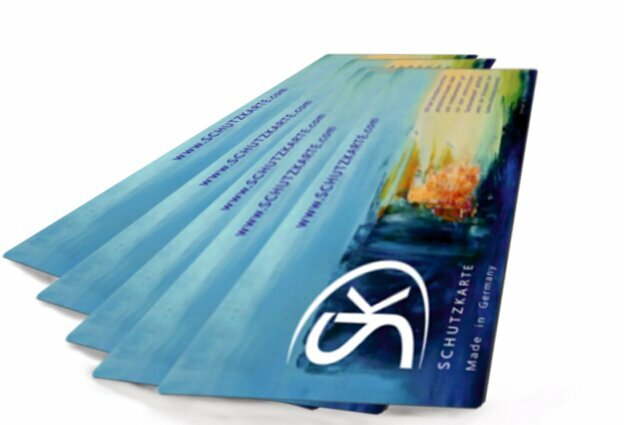 SCHUTZKARTE is a special foil - as thick and flexible and durable as banknotes. Size of the SCHUTZKARTE: 210 mm x 85 mm. If the SCHUTZKARTE is larger than your wallet, you can trim it to fit without compromising its protective function.